Looking to pamper yourself? Try making this DIY Oatmeal Exfoliating Bar recipe. All you need is a few simple ingredients and you have a great gift. These DIY Oatmeal Exfoliating Bars are a great intro into basic soap making – without the need to mess with lye. I have been wanting to make my own soap for a while, as I delve deeper into making more of our personal care products. It’s just such a great feeling to know what ingredients are going onto my family’s skin. With winter on the horizon, my skin is starting to get dry and my eczema is flaring up again. Keeping my skin exfoliated and moisturized is critical when the humidity levels drop this time of year. I love this recipe because oatmeal is very soothing and gently exfoliating, so it’s safe not only for my skin, but for the whole family. It works nicely for eczema too. You can also add essential oils with helpful qualities like lavender, frankincense and helichrysum. These soap bars also make a great homemade gift any time of year. In a double boiler, cube and then melt your soap over low heat, whisking frequently until completely melted and smooth. In a food processor, grind the oatmeal into a fine powder. Once the soap has melted completely, allow it to cool for 3-4 minutes. Add a few drops of essential oil at a time, until desired scent is reached. You can add as little or as much as you like, but don’t add more than is considered safe. In a silicone mold, sprinkle the bottom of each cavity with the ground oatmeal. Pour melted soap over ground oatmeal. If any air bubbles occur at the surface, spray them with rubbing alcohol to disperse them. Allow your exfoliating oatmeal bars to harden in the mold for 3-4 hours before popping them out of the mold and storing them in an airtight glass container. Have you ever made your own soap? If you try making this DIY Exfoliating Bar recipe, let me know how yours turned out! These are awesome and totally easy! I am so making these and giving them as gifts!!! Love the recipe! I will have to try it! I bet it would make a great Christmas present! 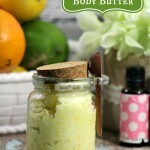 I love using homemade products, as I don’t always want to spend the money on chemical products. I’m glad to know that I can make an all-natural one at home in small amounts. Exfoliation kick-starts your skin’s renewal system, removing dead cells and uncovering the fresher skin that’s waiting underneath. I would definilately give it a try. Pretty and so simple! Thanks for the ideas! Wow – super easy! I’ve made my own soaps and lotion bars, but never done exfoliating bars before. Thanks for the recipe – can’t wait to try it! Yes, 12 oz of soap. And be prepared that it can take a long time to melt completely (up to one hour). I would LOVE to get these as a gift… great idea! I cant wait to make, how many does one bar of melted soap make? and is there other brand of soap that can be used? Yes, you can use other soaps as well, but I like castile soap because it’s natural. How many it makes will depend upon the mold you choose. This sounds great! 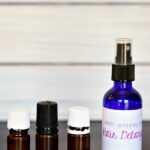 Do you have any oils you recommend? What about for toddlers – would this be safe? My son has eczema and I am finding Aveeno isn’t helping at all. Yes, this is a totally natural recipe so it would be safe for toddlers as long as they don’t have an allergy to any of the ingredients. Lavender is a good essential oil to start with for eczema. How long does the soap take to melt? I used Dr Bronners and only half a bar, as im only doing a portion of the recipe. I have had it in the double boiler for almost 45 min and its not even starting to melt. It will often take over an hour for it to fully melt. I am using one 4oz bar of castile soap to make this just to make a small portion of this recipe & my soap has not gotten close to melting in my double boiler & it has been over 45 minutes. I have a gas stove & I am worried if I turn it up too high it will melt. Is this recipe made on an electric stove? I just can’t seem to get the correct temperature. Any suggestions? You grated the soap, correct? It will take you over an hour to melt the grated soap. Just be patient. This is awesome! You make it sound so simple. Thanks for the recipe, I can’t wait to try it out! This looks great! Thank you for an easy to follow tutorial. I have had dry skin on my face all winter and I’m ready for it to go away! I’m going to have to try this! This looks fab, I’m thinking about making a basket of homemade beauty products for my sister. Pinned this. Love those oatmeal bars they look so cute and I bet they work great. Oatmeal is a great exfoliate and works wonders on my skin. We’re all about all natural in this household and try some crazy thing. We have a link party going on right now and I would love if you would share this with us. I love that your ingredient list is so simple. It’s something that I can actually make. I love it! What a great and easy way to make healthy soap. I have never tried to make my own before but I might give your process a try. I think I have all the ingredients – tools, too. These would make such perfect gifts!! Sounds easy enough! Excited to try these! Stopping by from #SITSSaturdaySharefest! Have a great weekend! G’day from Oz! Many thanks for linking up to the Say G’Day Saturday link up and sharing this great post. I’ve just pinned it, shared it on Google+ and I will also be featuring it at this week’s party. Hope you can pop by and say g’day again this weekend. made these today…followed directions exactly, but when I removed them from the mold the oatmeal on the bottom did not mix into the soap. I re-melted the soap and added the oatmeal throughout the soap. They look really nice and my hands feel very moist! What can I add as a preservative to make increase it’s shelf life? I’m making homemade masks and soaps and I really need help with preserving them! There aren’t any water-based ingredients in this melt and pour soap recipe, so you shouldn’t need to add anything else. When you’re using water in your recipes, that’s when you really need to be careful. From the research I’ve done, Leucidal Liquid SF seems to work best as far as natural preservatives go.